Gravity - why should this familiar force be "weird"? The force of gravity - more properly known as "gravitation" - is one that is familiar to all of us. It's what holds us down on the planet! It is also responsible for causing heavenly bodies to orbit other heavenly bodies and even caused the Universe as we know it to form in the first place, in the wake of the Big Bang. But, why is it "weird"? Well, for a start, it's by far the weakest of the four fundamental forces of the Universe. No-one knows for sure why this is. Also, it is unknown what the force actually consists of and how and why it works the way it does. This page will delve into this in detail. It was first believed that heavier objects fell faster than lighter ones. 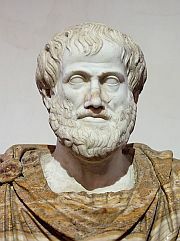 This dates back to ancient Greece and was proposed by such notable philosophers as Aristotle. 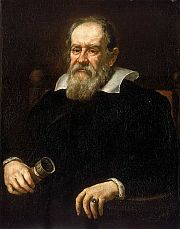 It wasn't until the end of the 16th century that Italian scientist, Galileo Galilei, suggested that objects fall at the same speed, whatever their weight. There is a famous story of his dropping different sized balls off the Leaning Tower of Pisa to prove this, but that is probably merely a legend. 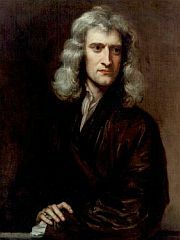 At any rate, his ideas led directly to the godfather of gravity - Isaac Newton. Once again, the famous story of Newton seeing an apple fall from a tree is probably fable. He did, however, in 1687, publish a scientific paper called "Philosophiae Naturalis Principia Mathematica", which postulated the so-called "inverse-square law". This states that the force between two masses is proportional to the mass of one times the mass of the other, divided by the square of the distance between them. This proportionality is known as "G", or the gravitational constant. The force always attracts the two masses together and the law became known as Newton's Theory of Gravitation. It was greatly successful at first, enabling Newton to predict the existence of a planet outside the orbit of Uranus. When Neptune was eventually discovered, the great scientist was vindicated. All was well until the 19th century, when certain aberrations in the orbit of Mercury were noticed that couldn't be explained with Newton's theory. Step forward Albert Einstein. One of the greatest scientific minds of the late 19th/early 20th century turned astrophysics on its head with his Theory of General Relativity, which also amounted to being a Theory of Gravitation. 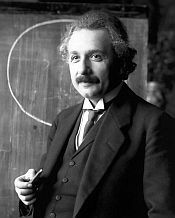 Einstein proposed the existence of something called "space-time", or the "space-time continuum", made up of the normal three dimensions we live in, linked with the fourth dimension of time. He suggested that the mass of objects in space actually distorted this space-time and the resultant warping manifested itself as gravity. When the anomalies in the orbit of Mercury were considered using Einstein's theory, they were able to be explained away. This theory still stands today. You may be thinking, gravity isn't weak, is it? Think of how much power rockets have to generate to escape the Earth's gravitational pull. But, let's consider it another way. You can probably jump a few feet into the air, I imagine. For a second, you have been able to overcome the gravitational pull of a huge planet. Or, what about the fridge magnet? The magnetism holding it to the fridge door is greater than the pull of gravity acting on it. Not a very strong force, really, then. But, why? Gravity is one of the four fundamental forces of the Universe. The other three are electromagnetism, the strong nuclear force and the weak nuclear force. It is thought that, at the moment of the Big Bang, all four were unified. But, after an inconceivably short time, gravitation became separated from the other three, for reasons unknown. Let's briefly consider the three other forces, to see how much further gravity is the odd one out. This is the strongest of the fundamental forces. Its job is to hold together the nucleus of an atom. Along with neutrons, which don't carry an electrical charge, the nucleus consists of protons, which all carry a positive charge and are, therefore, trying to repel one another. So, this strong force needs to have considerable power. Its influence, however, is confined solely to the volume of the individual atom itself - around one thousand million millionths of a meter. The electromagnetic force is the second strongest of the four - about 137 times weaker than the strong nuclear force. Essentially, it holds electrons and protons together, making it responsible for familiar things like electricity, magnetism and light. It also makes chemical reactions possible and is responsible for making solid objects...well...solid! Like gravitation, it obeys Newton's Inverse Square Law (see above) and has an infinite range. This force sort of works in conjunction with the strong force. When you get a particularly "heavy" atom, there are so many protons in its nucleus that their repellant force becomes greater than the strong force trying to hold them together - plus, being comparatively large, they are outside its very small range. This is when the weak force steps in to help. The weak interaction involves the changing of one type of quark to another. It is responsible for such things as nuclear reactions (which may cause radioactivity), the creation of heavy elements and hydrogen fusion in stars (causing them to shine). Its strength is one million times weaker than the strong force and it operates over a range one tenth the diameter of a proton (that's very small). Now, the enigmatic force of gravitation is six thousand million million million million million million times weaker than the strong nuclear force! Way more weak than even the weak force. But no-one knows why. There have been several theories, however. One suggests that there are higher dimensions than the familiar ones that we can detect and gravity is spread out into those, thus making it only appear weak to us. The other three forces cannot access these higher dimensions. Another, yet more fanciful, proposes that gravity "leaks" into other universes! Well, you might think, in this case, why doesn't gravity leak the other way, from the other universes into ours? Well, that's been proposed, too. Gravity leaking into our Universe may be what "dark energy" is. It's all very weird...and no-one has a clue, really. It is known that gravity is a force. As the mechanism of all other forces has been shown to involve movement of particles at the quantum level, it is reasonable to assume the same for gravitation. The theoretical particle in this process has been named the "graviton". Detection of this elusive, as yet unproved, graviton is an ongoing project within the scientific community. Because of the way gravity behaves, it is thought that the particle possesses no mass and will therefore be extremely difficult to observe. In fact, there are no scientific instruments currently in existence sensitive enough. It is also thought that gravitation displays "duality", which is a scientific term meaning that, as well as being a particle, it also behaves as a wave. Thus, we have "gravitational waves", which scientists reckon they have a better chance of observing. In August, 2012, the BBC reported that astronomers observing a pair of white dwarf stars orbiting one another noticed certain anomalies in these orbits. The explanation was that these were caused by gravitational waves. Gravitation is, primarily, the warping of space-time, as discussed above. Sometimes, however, under certain conditions, gravitational waves may be created, which are ripples in space-time, radiating out from their source. Imagine two stars in a binary system, joined together in some way, so that they resemble a dumbbell. If they are moving like the wheels of a car, joined by an axle, then they will not radiate gravitational waves. If, on the other hand, they are tumbling one over the other, then they will. So, the criteria for the production of gravitational waves are very exact. When they exist, they are very weak and impossibly difficult to detect. Yet, as was stated at the end of the last paragraph, scientists have managed it. As gravitational waves can pass through matter unimpeded, unlike light, they have the potential to allow astronomers to look further and further into the depths of the Universe, further back in time towards the Big Bang. That alone is the cause of much excitement. We'll have to delve into the quantum domain for this one. This deals with things on an extremely small scale and, at this level, things are very different from the familiar world you and I inhabit. The theoretical graviton is believed, if it exists, to have no mass (because the force of gravity has infinite range) and be a "spin-2 boson". The graviton is explored in detail on this site here. Bosons are dealt with here and "spin" is explained here. The bottom line is, if ever a spin-2 boson is discovered, it's likely to be the graviton. Just when physicists think they're getting somewhere in understanding gravitation, something happens to spoil it. In 1972, NASA launched Pioneer 10, a space probe designed to explore the outer solar system and eventually continue out into deep space. 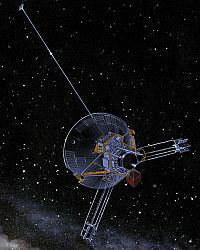 A year later, Pioneer 11 was launched, with the same remit. Both missions were a great success, with amazing, close-up photos of the outer planets and their moons being sent back to Earth. Then, in 1990, something strange was noticed with both probes' deceleration. It seemed that they were slowing down more quickly than they should, according to the gravitational pull of the Sun. It was only by a tiny amount, but it appeared to violate the rules of gravity. In 1994, it was decided to look into this more deeply. When this phenomenon was found to be real and not just a error in the measuring, various proposals were put forward to account for it. The most fanciful was that these spacecraft were simply violating the laws of physics and that the fundamental forces throughout the Universe were not always constant. Newton's Inverse Square Law would have to be rewritten. Others suggest that this problem is due to the presence of dark matter, or that it can be solved using "New Physics", which means revising all we know already about existing physics. The current, most accepted explanation is the existence of the "thermal recoil force". This is the emission of photons of radiation from the two crafts' engines. Part of the force is directed forward from the crafts, thus slowing them down slightly. Tests back on Earth trying to duplicate the conditions have found that they correlate with the two Pioneers' behaviour. So, it appears, problem solved. However, various study groups are still looking into the anomaly, to prove it once and for all. If it turns out to be anything other than this mundane explanation, all physics textbooks will be rendered obsolete. No wonder the scientists are so keen.